Tiyulon: What's with the Wheels? 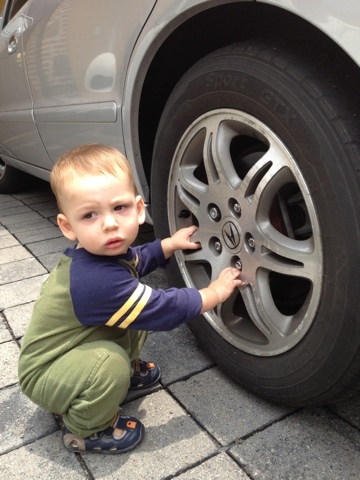 I have the sneaking suspicion that Baby Boy read a book called: "Real Boys Play with Wheels". It's like as soon as he became a toddler he reverted into some baby version of Tim the Toolman. The kid is obsessed with wheels: cars, trucks, buses, taxis, yes even the neighbor's minivan is riveting! When he's indoors it's all about his little vehicles (second only to his balls...) - the ones he had no interest in just a couple short months ago. As soon as he steps outside though, the real fun begins! He is obsessed with inspecting every rivet on our cars. On the off chance that his dad humors him with a "ride" in our bug he acts like the happiest person in the world! It is just amazing how he is becoming this little boy before our eyes.